In a small sauce pan, boil chicken stock or water. Add olive oil, cumin, salt and black pepper and stir in couscous and remove from heat and cover for 10 minutes. Fluff couscous. 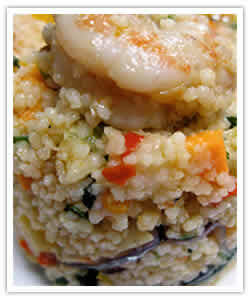 Pour couscous in the large container, and add all the veggies and mix well. Combine all dressing ingredients and whisk well. Pour dressing into the couscous and veggie mix and toss them very well.